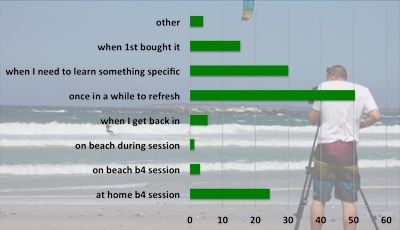 In a recent survey we found out that just under 75% of our sample owned an instructional DVD of some sort – thats an incredible 3 out of 4 kiters using video instruction to progress! 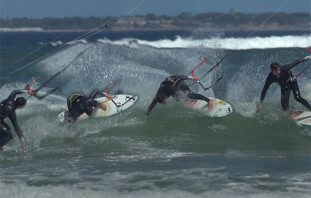 Video instruction is a valuable tool for any kite surfer. Whether your new to the sport and desperate to learn the basics, or an advanced rider trying to get your head round a complex technical trick. So, video instruction is good. But when are you supposed to watch a video to help you out the most? So mostly, people are watching instructional DVDs once in a while to refresh. This suggests to me that people are probably using them as a bit of inspiration on what to do next rather than just for instruction. Its so easy to get stuck in a rut but having a range of tricks on one DVD is an easy way to get ideas on what someone your level could try next. The next two most common viewing habits were much more focused around getting you ready to to head out and nail something specific. Doing this kind of homework before you head out can really help put you in the right mindset to learn something new. You can visualise the move as its supposed to be, you can understand the common mistakes so you know what to do when you make them, and most importantly it can physche you up to really want to nail that move yourself!  Our DVDs all have chapters which makes it easy to jump in where you want and quickly view the relevant section, and all of our videos online are easily searchable by trick name or level too. Few people are watching these videos on the beach, although i suspect that will change in the future with smart phones. Progression have loads of tricks interpreted into mobile tip videos available free on You Tube, these can easily be watched on a smart phone to refresh down the beach when you’re not quite getting it right! It was good to know that not many people watch it only when they first buy it, I guess sometimes we just need a gentle reminder of what we bought it for in the first place. So dust off those old copies of Progression or buy yourself the next level up – refresh, prepare and get those new tricks nailed! 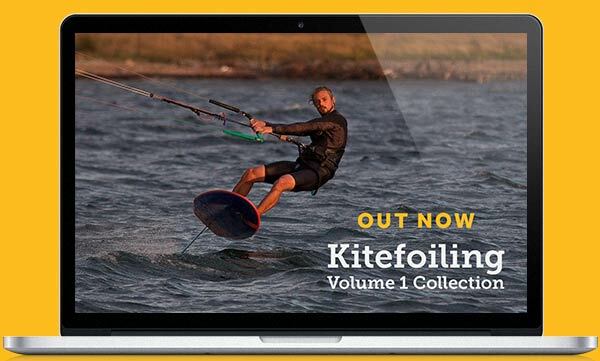 The worlds best selling kitesurfing instructional DVD - Just got better!